The innertube-like inflatable shelter is a lightweight design concept. Since future astronauts might be spending months at a time on Mars, their sturdy shelters must reliably insulate inhabitants from extreme outer temperatures and the cosmic radiation filtering through the planet's thin atmosphere. Some have proposed concepts that use material found on the surface, like this conceptual concrete, to minimize what the crew brings with them. Scientists and experts at NASA's Langley Research Center have came up with a novel, efficient solution that repurposes planet resources: The Mars Ice Home. 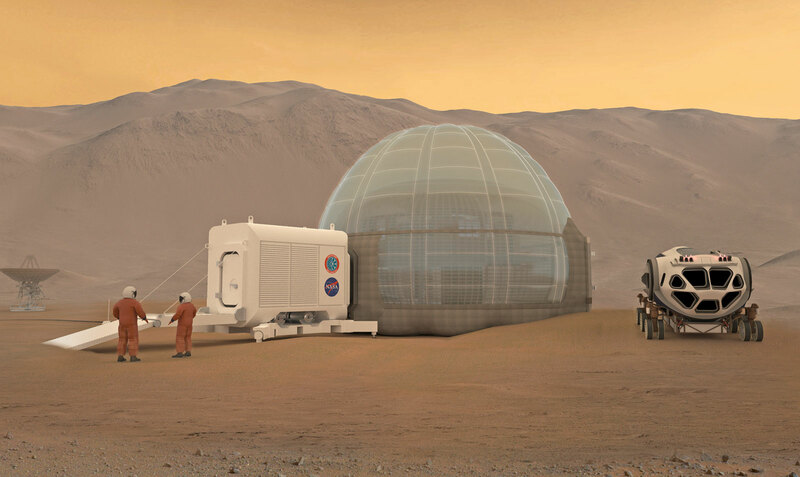 A team of NASA's LaRC engineers and designers from Clouds Architecture Office and SEArch made the design after they'd won first place in NASA's earlier Centennial Challenge for their 3D printed "Mars Ice House" habitat. Their new concept describes a torus -- a large, inflatable innertube -- lined with a shell of water ice. Not only is the structure lightweight, it incorporates materials from Mars itself. In addition, the water, which protects against cosmic rays, could be repurposed as rocket fuel for the Mars Ascent Lander. The Mars Ice Home is just a concept with some drawbacks -- for example, experts at Martian resource extraction say it would take 400 days to fill the shell with enough water directly from the planet. On the other hand, robots could inflate and pump the shelter while the astronauts are en route, and the water's radiation shielding would allow the shelter to exist aboveground, obviating the need to dig deep enough to protect the shelter's inhabitants. It's far more theory than ironed-out solution, but the Ice Home is just the kind of fascinating concept that will prod designers and experts to innovate elegant, efficient answers to Martian exploration's challenges.